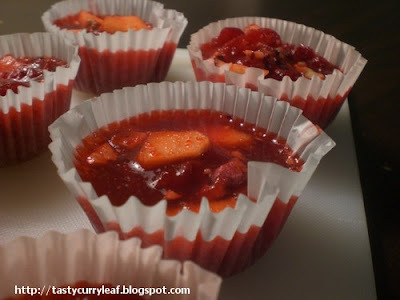 Cranberries are in season during the last two months of the year and are a major part of Thanksgiving.I found that there is a simple cranberry and raspberry jello salad which is supposed to be traditional and adjusted the recipe a bit.It is very quick and involves only freezing. 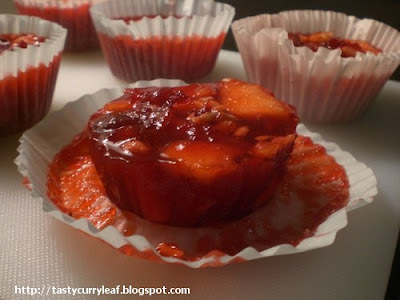 Prepare the jelly as per package instructions and mix in all the other ingredients and pour into mini muffin tin lined with paper cups.Refrigerate overnight or atleast 4 hours.Serve individual jello cakes in plates or line together in a big serving tray. That is cute, I have heard that using silicone muffin pans makes them pop out easier, but never tried it. wowow lovely n so cute jello..delicious also awesome..
Sweatha, if you don't know already jello is made of gelatin which is made of animal bone marrow. So is marshmallow also. I'm mentioning this because you are into vegetarian cooking. Beautiful, i ve seen in Holiday cooking book this recipe! Absolutely beautiful cups of jellos!